Whenever I have the opportunity to travel I make a point of visiting the local museums and galleries and I am always on the hunt for MathArt. In Toronto, I visited the Distillery District, which is a collection of brick historic buildings that was once a whiskey distillery, but is now filled with galleries, restaurants and artist’s studios. I was in the Thompson Landry gallery when I spotted mathematical formulas that seemed to come directly out of my old Integral Calculus text book. I became immediately interested in the work of Étienne Gélinas. 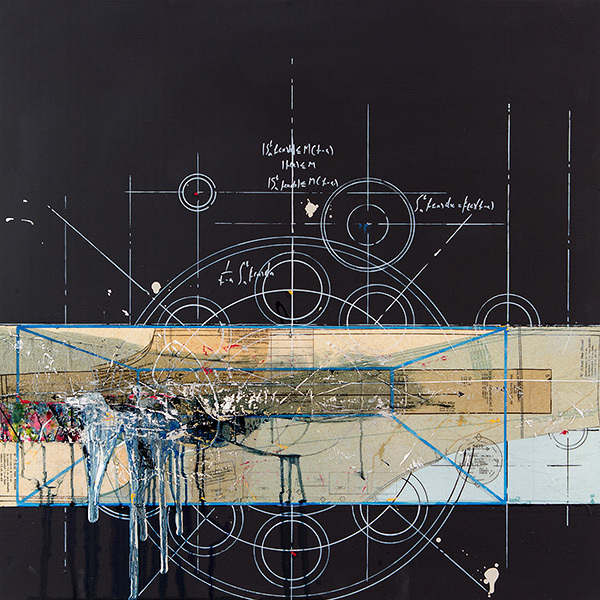 He uses a variety of techniques to create multi-media work: scratching geometric drawings into a thick base coat of paint or medium, collaging with paper blueprints, floor plans and garment patterns, and carefully painted shapes and formulas. The artist also adds a random accidental quality to each work by including an expressive element of abstract splatter drip and mark painting. In the work “Composition 365” Gelinas has used a circle as his underlying geometry. There is a series of larger concentric circles which have been segmented into 8 equal sections with smaller series of concentric circles within each segment. Around this circle pattern there are mathematical formulae, specifically integral formulae. This formulae painted in white on the black background are quite beautiful. Dividing the work horizontally, the artist has placed layers of vintage patterns for making clothing. On top of the collaged element Gélinas has painted a free form abstract painting. There is a lot going on in this work and that is what I like about it. The seemingly disparate techniques yield complex work with a great textuality. To me the work addresses the layers of mathematics in society. There is the obvious association of the calculus formulae, and the geometric implications of the drawn diagrams relate to the geometry used in making the paper garment patterns. Finally, the wild abstraction of the gestural painting adds a level of spontaneity and emotion to the visual dialog. It is not often I find single work of art with so levels mathematical aesthetic.